I have recently had some issues with a client’s account in Microsoft’s adCenter. 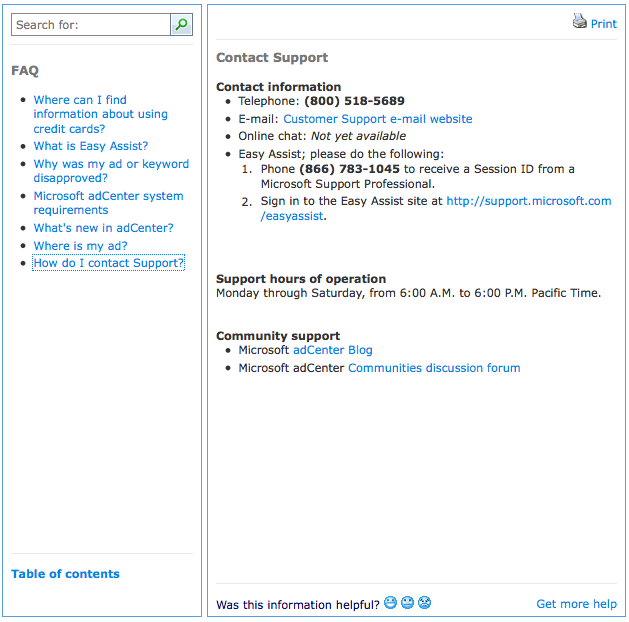 When Microsoft first launched adCenter – their search advertising system, I signed up and called in for some reason and realized at the time “customer support” was being handled by a call center. During my call, I asked the CSR if they were an employee of Microsoft and she replied she wasn’t. I thought maybe they had outsourced customer support initially because they were just launching their service. I hadn’t called them since. Yesterday I called in to investigate why my client’s ads were not being displayed under search queries for their brand name. After a series of questions about the account from the adCenter customer support representative, I told her all I did was load two new text ads – over a week ago. The entire account hasn’t generated any impressions let alone clicks since. I then asked are you in a call center offsite? Yes. Are you a Microsoft employee? No. If you have some free time on your hands, call adCenter’s customer support telephone number to discuss the nuances of pay per click advertising with “Microsoft’s” “customer support” staff. You might be glad Microsoft hasn’t bought Yahoo’s search marketing business.